Historic Formula Fords, both in 1600 and 2000 categories, will take centre stage at the Historic Sports Car Club’s race meeting at Snetterton on Saturday (23 September). Unusually, the one-day race meeting does not feature any closed-cockpit cars and each of six grids will have a pair of races after qualifying on Saturday morning. Apart from the Classic Clubmans, the other races are all for single-seater categories. The contest for the Historic Formula Ford 1600 Championship, in the category’s 50th anniversary season, is really hotting up and two races at Snetterton will be followed by the two final races at Silverstone in October. After 10 of the 14 races, Michael O’Brien heads the points on 189 from Callum Grant on 167 and Richard Tarling on 160. However, drivers must drop two scores in the final reckoning and when dropped scores are factored in to the current totals less than 10 points cover the three racers. What is certain is that all three drivers must claim major points at Snetterton in order to be well placed for the Silverstone final. Of course, this is not just a three-way battle and drivers like Sam Mitchell, Benn Tilley, Benn Simms and Max Bartell are all in contention for race wins. The real darkhorse is Cameron Jackson who returns to the grid in the Lola T200 he took to victory at Brands Hatch in July. The Historic and Classic Formula Ford 2000 grid is outstanding with 30 cars lined up for a pair of races. The Historic Championship title has already been retained by Andrew Park but the contest for second place is far from settled as Graham Ridgway, Andrew Storer, Tom White and Davy Walton are all closely matched. Aiming to join the series in style is former FF2000 title winner Ian Pearson in a newly-restored Royale RP30. Racing starts with the first of two races for the HSCC/FJHRA Silverline Front-Engined Formula Junior Championship where local racer Will Mitcham is likely to set a fierce pace in his U2 Mk2. With seven wins from 10 rounds to date, Jon Milicevic (Brabham BT21B) is looking favourite for the HSCC Historic Formula 3 Championship and could even be declared the champion at Snetterton if things go his way. Ranged against the rapid Towcester garage owner are more Brabhams for Jim Blockley, Michael Scott and Leif Bosson. Another driver in with a chance of securing a title by the end of Saturday afternoon is Classic Formula 3 Championship leader Gaius Ghinn (Ralt RT3). With second-placed Richard Trott not entered at the time of writing, the closest challenger to Ghinn could be David Thorburn in the ex-Martin Brundle Ralt RT3 and Brands Hatch double-winner, and former champion, Max Bartell in his ex-Rupert Keegan Chevron B34. Running with the Classic F3 cars will be the Classic Racing Car pack, headed by Mark Goodyear (Lotus 59), Julian Stokes (Tecno) and Nick Pancisi (March 712). Finally, two races for the Classic Clubmans Championship round out the programme with a good grid of the amazingly fast front-engined sports-racing cars as well as several period Sports 2000s running in the invitation class. Mark Charteris (Mallock Mk20/21) is the standard-setter but John Harrison (Mallock Mk20) showed tremendous pace last time out at Oulton Park to make Charteris work hard for another victory. 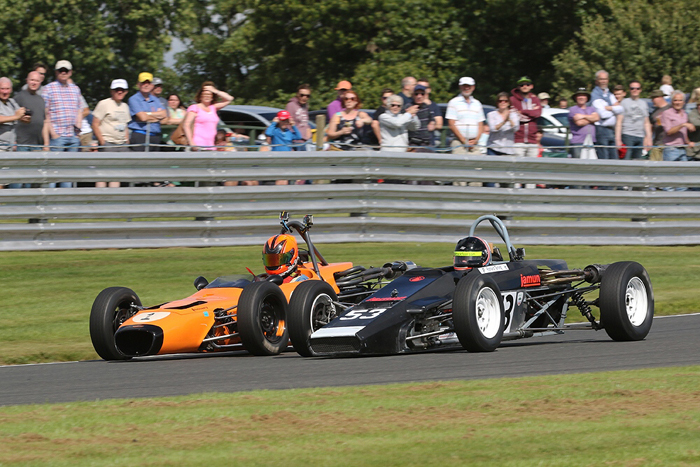 Clive Wood (Mallock Mk20B) is looking strong in Class B for the 1600c Formula Ford-engined cars.